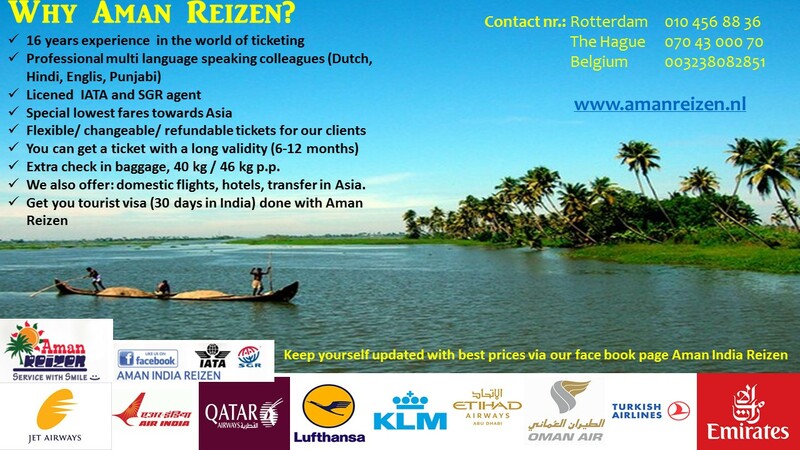 Hereby introducing our first ‘Travel Partner’ Aman Reizen! Aman Reizen provides best and lowest fare tickets to India. In fact they are also working out to arrange special offers/ deals for outbound flights to Kolkata and return. In a way they are extremely eager to connect to our dear Bengali friends and open up more travel options to Kolkata. They also have fantastic deals for dream destinations like Dubai, Singapore, Thailand, Nepal, Srilanka. Aman Reizen is your own IATA & SGR dedicated company to provide a combination of most personalized and high quality services. All their Dutch, English, Hindi, Punjabi speaking efficient and hardworking employees makes your travel plans according to your travel dates and according to your wishes. They have signed up special contracts with most of the airlines like Emirates, Etihad airways, Qatar airways, Swiss, Lufthansa, Jet Airways, KLM and many more, so that they can offer tickets with longer validity, flexibility, changeable tickets, with excess baggage like 40-50 kg and many more. Their mission is : “Come as a guest and go as a friend”. Creating interesting, unusual and personalized travel for our clients is their moto. Please follow Aman Reizen at facebook for new updates regarding new offers/schedule change, lowest price deals for Bangalore, Hydrabad, Kochi, Kozikode, Delhi, Mumbai, Kolkata. Aman Reizen have also started their new booking engine www.indiatickets.nl, and always you can check the fares directly with their office also. We would like to thank Aman Reizen for helping us with a cause. Looking forward to continue this relationship in long term.